Today I celebrate DOLORES HUERTA – one of my all-time heroes, I suppose that I should say ‘heroine’ but homegirl has shown me, time and time again, that she has the huevos to back herself up! Dolores Huerta definitely walks the talk and was an inspiration to me as I was growing up wanting to make a difference and not knowing how. Much of what I learned, I learned by watching mujeres like Dolores Huerta. 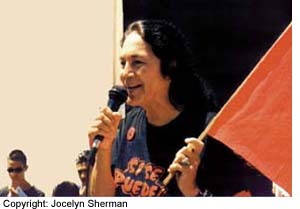 More poignant to me is that she actually was from Stockton, went to Delta College (like I did) and was a huge community organizer before co-founding United Farm Workers with Cesar Chavez and galvanizing the entire country and the world to support farmworker rights.